HBO Asia’s “Folklore” is a six-episode, hour-long series that takes place across six Asian countries – Indonesia, Japan, Korea, Malaysia, Singapore and Thailand. Each episode is based on a country’s deeply-rooted myths and folklore, featuring supernatural beings and occult beliefs. The respective episodes are helmed by a director from that country and filmed locally in the country’s primary language. In the particular segment, Lee Sang-woo deals with the myth of the Mongdal, a ghost that spawns when an unmarried man dies. 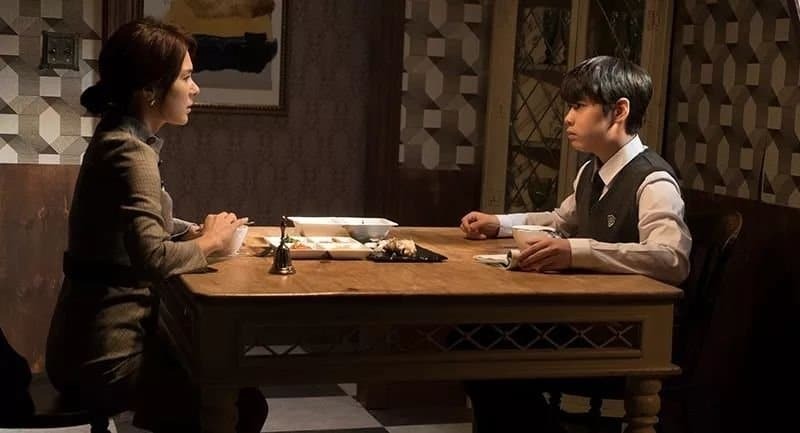 The film revolves around a schoolboy who borders on being a sociopath and his mother, who is also the strict headmaster of the school he attends, that tries to appease him by granting all of his occasionally absurd wishes. His behaviour, though, becomes worse when a new girl arrives at school, and the young man decides that he will win her over, with any means possible. When things do not go his way, tragedy strikes, and a determined mother is willing to go to extremes to prevent her son from becoming a mongdal, after a shaman advises her so. Lee Sang-woo directs a film that revolves around two axes, one that lingers towards the drama and one towards the horror movie, with the two eventually connecting. Regarding the first, the main element is the love of a mother towards her child, which is presented as a sentiment that ignores logic, and even worse, can make a woman to disregard completely both her own and the ones around her, in order to secure the best for her offspring. This aspect involves some other social comments, highlighting the fact that conceding in all of a child’s wishes is as bad as the denial for the psychiatric issues one can have, and the way society addresses unmarried people. Through these concepts, Lee leads us towards the supernatural horror, with the appearance of the Mongdal, but particularly the actions of the mother, turning the film from a dramatic, psychological thriller, to a distinct horror one. In terms of aesthetics, Lee follows the same path, as the first part leaves an ominous sense that something bad will happen, which turns fully supernatural horror in the second, including jump-scares. In that regard, the cinematography, and particularly the framing is exceptional, highlighting all aspect of the film in the best fashion. After “The Wailing” it seems that all Korean horror films (to say the least) “must” include a shamanistic ritual sequence, and “Mongdal” is not an exception, in a scene though, that is among the most well-shot in the film, along with the finale involving the young girl. This concept also highlights the role superstition plays in the Korean society, when even such an educated disregards science and succumbs to magic. The acting is one of the best assets of the movie. Lee Chae-yeong is excellent as the mother whose lack of love from a spouse directs all her own towards her son, with the difference in the attitude she presents in front of her students and in front of her son highlighting the fact in the best fashion. Furthermore, her transformation towards the end adds another layer to a performance that already worked in multiple levels. Jung Yun-seok is also quite convincing as the young sociopath, as he exhibits the behaviour of an individual that cannot cope with any kind of denial, with his downward spiral being quite good, although a bit hyperbolic at times. Furthermore, the chemistry of the two is one of the best assets of the film. “Mongdal” does not avoid a number of clichés of the genre, but in general, is quite entertaining with the combination of horror/thriller and social commentary working very well.